Precious Ramotswe, the esteemed proprietor of the No. 1 Ladies' Detective Agency, now faces her greatest challenge yet: a vacation! Business is slow at the agency—so slow in fact that, for the first time in her distinguished career, Mma Ramotswe has reluctantly agreed to take a holiday. The week of uninterrupted peace is cut short, however, when she meets Samuel, a wayward young boy with a troubled past. 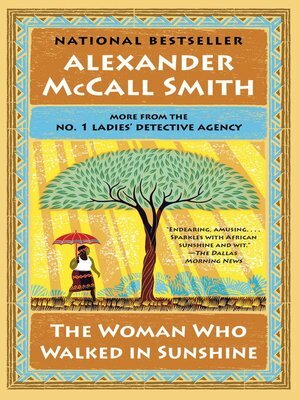 Moreover, Mma Ramotswe can't help but wonder how the agency is faring in her absence. Her worries grow when she discovers that Mma Makutsi is handling a rather delicate case. Ultimately, the situation will require Mma Ramotswe to draw upon her kindness, generosity, and good sense, and will serve to remind them all that ordinary human failings should be treated with a large helping of charity and compassion.